Behind every company’s brand and logo, there is an artist who helped bring their vision to fruition. Meet Lynn Murphy, our Director of Creative Services, who conceptualized and created our SparkPost name and iconic flame logo. I sat down with her recently to learn the what the design process was like and what keeps her creative spark burning. As a seasoned designer, I have worked on a number of logo designs and rebrands for previous clients. Therefore, I had a pretty strong process in place and was able to jump right in. I started by getting the lay of the land, researching the email industry, our competitors (and their logos), and the audience we wanted to target. The next step was to compile a list of words that embody our brand personality, goals, product, and industry. Once I had my list, I whittled it down to 12 words that best represented the brand. The reason I go through this exercise (and make it part of my process) is because the majority of the clients I work with are not visual people. For them to be able to connect with a brand’s identity, they need to see words. This practice is very beneficial for designers when pitching to decision makers and clients. Then I started to sketch, by hand, each word or word family to see how that same emotion would translate visually and graphically. I took the sketches that had the most potential, scanned them, and started to trace over them in Adobe Illustrator. At this point, I also started to research various typefaces to see how all of the letterforms would look together. I continued to make more sketches and iterations of what I already had. I finally came up with three designs to present. When I presented the final logos to our team, I began by showing the brand words and mood boards before the actual designs. This set the scene for the logo presentation. The pitch was successful, and our new SparkPost logo was chosen right then and there. What were some of the steps you took to make sure the SparkPost logo would be unique and recognizable? I created an additional mood board of just our competitor’s logos. I printed it out and hung it on the wall front of me as I designed to make sure we would stand out from the crowd. As I narrowed down the designs, I dropped them into the mood board and was able to tell which logos stood out the best. When designing a logo, what key things do you consider? There are three main considerations for designing a new logo. First, you have to understand the industry and your competitors. Second, it’s imperative to know the core values of the company and its brand personality. And third, you need to keep in mind what the company’s goals are and their mission statement. Colors can evoke strong emotion, can you elaborate on why the SparkPost flame is orange? I picked our color, which is a deep and bold shade of orange, because not only did it compliment our Message Systems logo, but it was a strong, powerful color which reflected our core brand words. Also, SparkPost’s name is inherently visual. 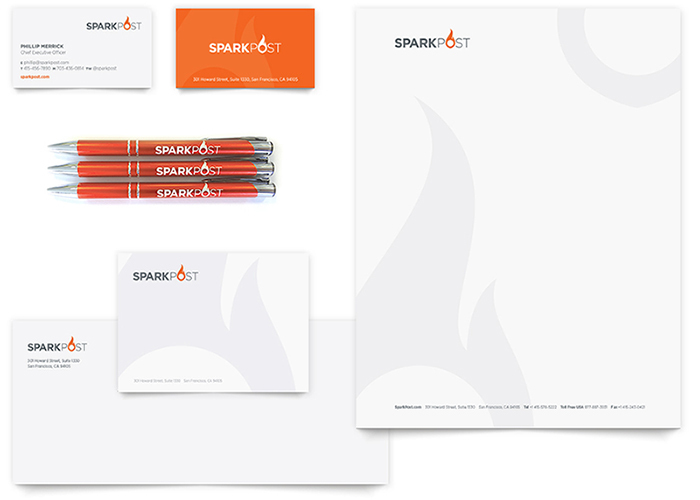 Sparks are typically orange, and having a lime green color for a company with the name “Spark” just didn’t seem right. How did you go about choosing the typeface for the logo? Were there any alterations you needed to make? I looked primarily at San Serif typefaces, which have a more progressive and modern feel to them (as opposed to a Serif font like Times which is more classic and traditional). The font we settled on was Gotham. However, I did have to customize some of the letterforms to better balance and incorporate the flame. Can you elaborate on why the bottom of the flame is pointed instead of round? It is the point of initiation, that is, how a spark starts before turning into a flame. I guess a great metaphor would be how an idea is formed and brought to life. The point at the bottom of the flame, which is where the spark starts, there is a quickness to it which symbolizes our product and how fast it moves for our customers. What were some of the proportion and symmetry issues you faced while designing the flame? It was very challenging to make perfect curves. Being a perfectionist, I spent a significant amount of time refining the logo to make sure the angles and curves were as accurate as could be. What are some brands that you admire that influenced your design? I like brands that are edgy and have a direct message. Two names that come to mind are Android and Apple. Both have simple logos but are very powerful in getting their message across. From where did you draw inspiration for this project? The developer audience was relatively new to me. Luckily, I live in San Francisco where there are A TON of developers. I walked around all of the different San Francisco neighborhoods and hung out at developer hotspots. I got to know their personalities, their likes, dislikes and got a feel for who they are as a group. I also read up on different tech gadgets and trends that fit their personality and different words that would resonate with them. What advice would you give to designers who are currently building out a brand? Go through the entire process that I outlined here and do your research and due diligence. Keep in mind that your client or your stakeholders may not be visual people. They can’t see the logo and brand the way you can. What I did with my presentation was take the extra steps of placing the logos in context. I created a t-shirt, an app-icon, and a web page with the logo options to show how they work in real life. This was definitely key to having our team make such a quick selection of the final logo. It’s worth the extra time and steps in the end. Also, research your client or stakeholders. Know who they are, how they think and what they are looking for when it comes to their brand so you will be able to connect with them. What is the spark that keeps you going every day? My manager Tracy Sestili has created a fun environment to work in and is constantly challenging me to push the boundaries creatively. I can say with confidence that she has made me a better designer. It’s exciting to be part of a team that is willing to take risks, try new things, challenge authority when they know they are right, and isn’t afraid to fail. I draw a lot of inspiration from my other team members when it comes to brainstorming ideas and getting visual feedback which has resulted in some really cool designs. It is also very fulfilling as a designer to see people interacting with our brand and engaging with the designs that I have created. SparkPost is part of a continually changing industry, and our audience is comprised of a lot of technical “elitists” as I like to call them with really high expectations. I’m always on my toes and have to figure out what is coming up next before it even happens. That’s what makes it exciting, knowing that each day is going to be different from the last. That is definitely what keeps my creative spark burning. Got questions or comments for Lynn? Feel free to tweet us -we would love to hear from you!